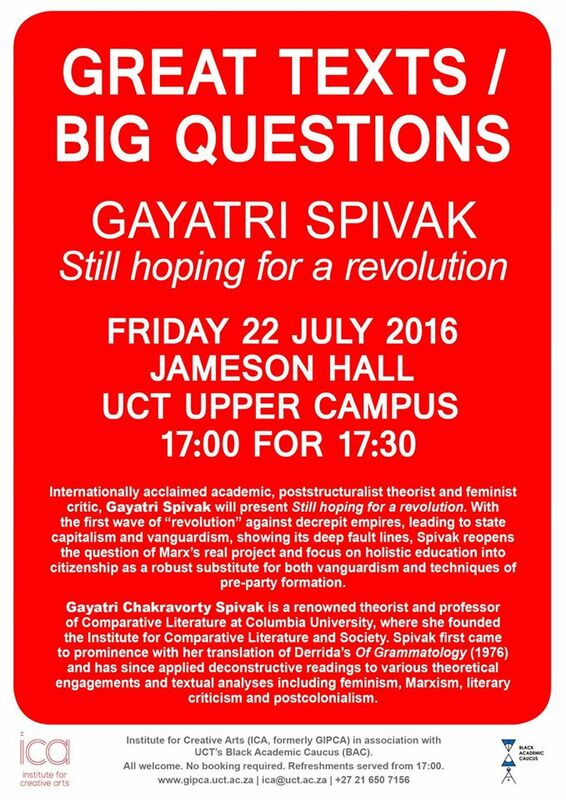 The Institute for Creative Arts is proud to present internationally renowned theorist, Professor Gayatri Spivak. Gayatri Chakravorty Spivak is one of the most significant and influential literary theorists of our time. Having first come to prominence with her translation of Derrida’s Of Grammatology in 1976, Spivak has since applied deconstructive readings to theoretical engagements and textual analyses including feminism, Marxism, literary criticism and postcolonialism – capturing complex theories that transgress disciplinary boundaries. The Institute for Creative Arts (ICA, formerly GIPCA) in collaboration with UCT’s Black Academic Caucus (BAC) is honoured to present this esteemed academic and philosopher as part of the ICA’s Great Texts/Big Questions lecture series. Now that the first wave of “revolution” against decrepit empires, leading to state capitalism and vanguardism, is showing its deep fault lines, I reopen the question of Marx’s real project and focus on holistic education into citizenship – as the conjuncture has moved from the central agency of the industrial proletariat – as a robust substitute for both vanguardism and techniques of pre-party formation. Gayatri Chakravorty Spivak is currently professor of Comparative Literature at Columbia University where she founded the Institute for Comparative Literature and Society. Her critical writings include Of Grammatology (1976), In Other Worlds: Essays in Cultural Politics (1987), The Post-Colonial Critic (1990), Thinking Academic Freedom in Gendered Post-Coloniality (1992), Outside in the Teaching Machine (1993), A Critique of Postcolonial Reason (1999), Death of a Discipline (2003), and Other Asias (2005). The lecture, followed by an open question and answer session, will take place from 17:30 – 19:00 on Friday 22 July 2016 at Jameson Hall, University Avenue, University of Cape Town Upper Campus. Refreshments will be served from 17:00. This entry was posted in personae, philosophy, politics and tagged black academic caucus, fallism, feminism, gayatri spivak, gipca, ICA, institute for creative arts, revolution, subaltern, university of cape town. Bookmark the permalink.